Control Panel Labels | Data Graphics Inc. Control Panel Labels | Data Graphics Inc.
Why Choose Data Graphics as Your Mylar Printer? Mylar labels are used to resist exposure to a wide range of harsh and demanding work environments, and we use a precise manufacturing process to ensure you get the best products. We continually invest in the best equipment and certifications. You get exceptional quality only the best commercial printer can provide. Award-Winning Quality: Data Graphics is proud to be one of the most highly decorated Mylar printers in the nation. 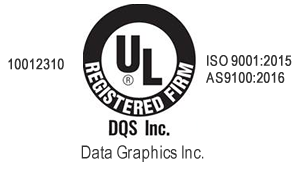 We are also one of the few Mylar printers who have been UL Approved, AS 9100: 2008 Compliant, Metalphoto Certified, RoHS Compliant, and ISO 9001: 2008 Certified. We are accustomed to having our work scrutinized. 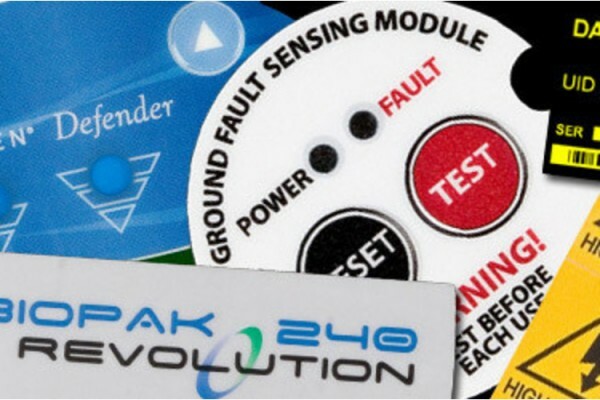 Every working day we manufacture Mylar labels that meet UL 969 and PGGU2 standards. The standards for our Mylar printing services are so high that more than four out of five customers repeat order with us. Moreover, we average 99% approved order rates. Speed: We are fast Mylar printers. We mean really fast Mylar printers. Call 800-639-4316 now and see for yourself just how fast our process is. We are an industry leader in Mylar printing services, with turn-around times of just 2-10 working days. Fast turnaround time on your orders, include free expedited Mylar printing when necessary. We get your Mylar overlays, tags, name plates and labels to you on time. Period. In fact, more than 60% of our custom Mylar tags, overlays, labels, and nameplates are shipped ahead of time. Our Versatility Saves You Headaches and Dollars: Data Graphics is one of the most versatile Mylar printers in the nation. If printing on Mylar is truly your best printing solution, we can either screen print or digitally print. Screen printed Mylar overlays, labels, tags and nameplates tend to have the most vibrant colors and can be most cost-effective on larger runs. Digitally printed Mylar overlays, labels, tags and nameplates can create photo quality images with color gradient, and tend to be most cost-effective on smaller runs. There is also the possibility that printing on Mylar is not the best possible solution, and that printing on another substrate, laser etching, digitally engraving, or metalphoto ® printing is a better option. This is especially true if your custom label needs to endure years of abuse, or exposure to the elements or harsh chemicals. Over the years, these other methodologies might prove significantly more cost-effective because the label or nameplate does not need to be replaced for decades. Our expert staff will be happy to provide you with the best Mylar printing solutions. Great Service Comes Standard with Our Mylar Labels: You won’t find many Mylar printers who you enjoy working with as much as Data Graphics. We feature great, personalized service that makes your entire ordering process easier, including one dedicated point of contact for error-free orders. Our friendly, helpful, knowledgeable staff has literally hundreds of years of collective experience. With that level of experience, we know how to solve Mylar printing problems. We do whatever it takes to help our clients’ solve their printing problems and find the most cost-effective solution, whether that is printing on Mylar or another substrate, using whatever methodology works best. Security and Confidentiality: Data Graphics is one of the few providers of Mylar printing services that is also ITAR Registered (International Traffic in Arms Regulations Compliant). As an ITAR firm we adhere to the highest standards of security and confidentiality for our clients. Your Mylar printing projects couldn’t be in safer hands. The Perfectly Size for Mylar Printing Services: We are large enough to have all of the tools and capabilities you need, and small enough to provide you with personal, caring service. 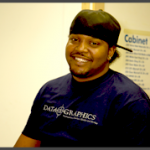 Data Graphics is the rare mylar printer that has a variety of the most modern and high tech machines. We can handle any Mylar decal, tag, label, or overlay. We can print in whatever way works best for you. We do all of our own fabrication in-house, so there are no delays on getting your Mylar labels die-cut, embossed, or kiss-cut. We have redundancy for all of the machines involved in our Mylar printing services, so a glitch with one printing or die press will not delay your order. In spite of our advanced Mylar printing capabilities, however, we are still small enough that our customers aren’t numbers, but valued clients. We want to be your Mylar printer for life. You won’t find a Mylar printer as committed to your success as Data Graphics. Getting Your Mylar Label Right the First Time: We have 100% inspection standards. That means we examine every single one of your custom Mylar labels, unlike most of our competitors which just inspect random samples. We know how vital it can be to get your Mylar printing done right and done on time. Trusted Mylar Printing Services: Data Graphics has worked hard to build a reputation as the nation’s top provider of Mylar printing services. We feature big-name clients that refuse to risk their brand to less experienced companies or lesser quality Mylar labels. For more than three decades, we have been supplying our customers with the very best Mylar printing services. Our happy clients read like a “Who’s Who” of Fortune 1000 manufacturers, including Boeing, GE, Lockheed-Martin, and even NASA. Read their testimonials. Each of the thousands of Mylar tags, overlays, labels and nameplate we create is manufactured to the same high standards as if it were going on a jet fighter or space shuttle. We won’t risk our reputation on anything less. All of our Mylar labels can manufactured UL compliant, and can be recognized under UL 969 – UL File No. PGGU2.MH10170 Marking and Labeling System Materials. Our boPET polyester film comes in clear, and haze, haze sometimes called frosted (low haze, moderate haze, high haze). We also have clear sticker substrate spec sheets and and frosted sticker substrate spec sheets available upon request. Mylar printing is done on a substrate known as boPET polyester film. BoPET (Biaxially-oriented polyethylene terephthalate) is a polyester film made from stretched poly-ethylene terephthalate. This versatile polyester material was developed in the 1950’s by DuPont, Imperial Chemical Industries and Hoechst, and also goes by the common trade names Melinex and Hostaphan. It burst into the public consciousness in 1964, when NASA launched Echo II, a high altitude boPET balloon 40 meters across. Since then, it has been employed in an amazing number of different applications because of its versatility, and because it can integrates so well with other compounds to create new materials. The reason most firms turn to printing on Mylar is because it provides a great combination of functional durability and versatility at a cost-effective rate. Printing on Mylar has been recognized by UL for indoor/outdoor use with occasional exposure to lubricating lubricants, cleaning solvents and some chemicals. 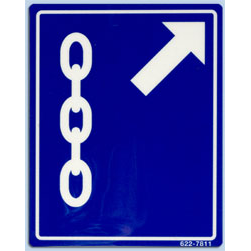 The ink-receptive surface is compatible with most conventional and UV ink. Thus, when printing on Mylar, the primary concern is color match and choosing an ink that is appropriate to the use, such as fade-resistant UV inks. The decision is based on the application, and not the substrate, unlike some materials. We can screen print or digitally print Mylar labels, which means it is possible to include variable info, such as UID’s, barcodes, QR codes, and serialization. Printing on Mylar leaves you with a consistently smooth surface and a clean finish, regardless of printing methodology. A Mylar decal, tag, overlay, or labels is both flexible and maintains high tensile strength. Mylar labels are quite durable both chemically and dimensionally stable, especially for a plastic. 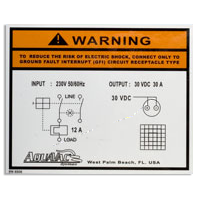 They possess outstanding mechanical and dielectric strength.A Mylar decal has low water absorption capabilities and is a remarkably good electrical and heat insulator. In fact, it is such a good electrical and radiant heat insulator that metal laced Mylar is used in aerospace, thermal blankets, and even NASA space suits. A Mylar decal, label or overlay is able to withstand extreme heat fluctuations, as high as 302 degrees as cold as – 40 degrees. One of the advantages of printing on Mylar is that the substrate is compatible with a wide array of bonding agents and pressure sensitive adhesives. Permanent pressure-sensitive acrylic adhesive bonds well to low- and high-surface energy plastics, metal, powder coated paint, paint, ceramic, paper/fiber, glass and fiberglass. Some adhesive offers moderate tack, peel and shear properties. Other adhesives offer high initial tack, high shear, and high ultimate bond to a wide variety of surfaces including low surface energy plastics and painted metal. A Mylar decal, overlay or label can have high performance characteristics in many different circumstances and on a wide range of surfaces. At Data Graphics, we manufacture and deliver Mylar labels to our customers in the industrial manufacturing, technology, telecommunications, medical, military and aerospace industries. Our custom labels have endured and survived in some of the most exacting and punishing working environments on the planet, from the middle of the ocean, to tens of thousands of feet above the surface of the earth. Get a fast quote on the durable labels that can withstand all the punishment you throw at them. In short, companies large and small look to Data Graphics for Mylar printing services around the world and in nearly any conceivable application. Reach out to our friendly team for a quote on your Mylar label order. This is just one of the durable materials we use at Data Graphics to meet the specific needs of your label nameplate, or overlay order. We pride ourselves on providing the best full service custom printing solutions. We will help you find the best materials, adhesives, and printing methodologies for your unique project. We are proud to be recognized as one of the leading Mylar printers in the nation, and would welcome the chance to discuss your project. Our Mylar printing services are unrivaled, and we would love to create your Mylar labels. Please call us today at 800-639-4316 and discover the DG difference for yourself.